Choose the right product for your job! Bill Hirsch began over 40 years ago in the U.S.A. Its original purpose was to service the auto, military and motorbike markets. Since then its versatility and durability has seen it put to work in all sorts of areas - many of them quite unexpected; Boats, trailers, homes, factories, helicopters, farms, and mining equipment - the list goes on and on. Wherever there is a need to protect against rust or corrosion or purely for its sheer durability Bill Hirsch Miracle Paint is the best product to use. We would love to hear of any new uses (they seem to come up all the time). Please let us know as we can publish them on our website so others can benefit as well. NOTE: The application of Bill Hirsch Miracle Paint and Preparation Products will depend on the material and environment in which it will be used. Often not all steps are required. instructions on a supplementary sheet as well as the label on the item. Please read and follow them carefully. You’ll love the results! Everyone who uses the product correctly confirms it does what it says. 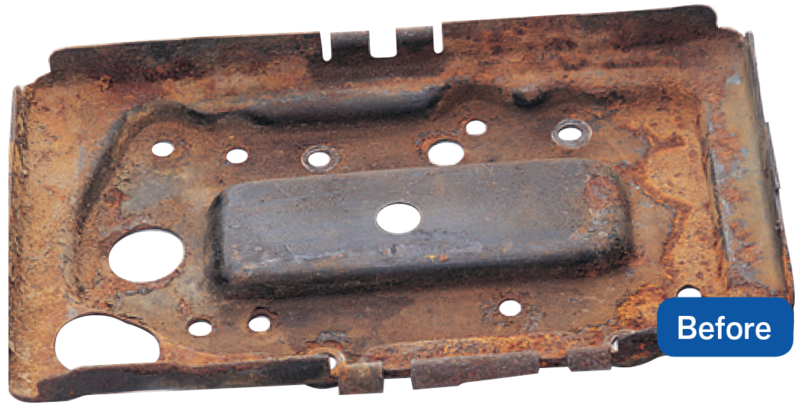 BEFORE: We have used an acid damaged and rusty battery tray as our illustrated example as they are a common problem. They can be fixed permanently as battery acid won't affect Bill Hirsch Miracle Paint, nor will brake fluid (up to dot 4). Get rid of loose rust with wire brush or sandpaper. 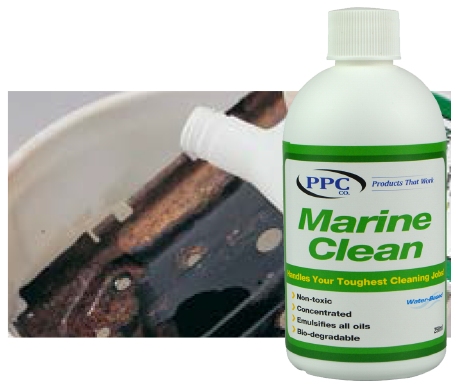 Clean rust or corroded metal with a diluted (50:50) Marine Clean, a powerful yet water based cleaner. Marine Clean removes dirt, grease, wax and other contaminants that could interfere with your restoration. Rinse off well with water (don't use solvent based degreasers like Prepsol). This step is not necessary on newly sandblasted or painted surfaces. 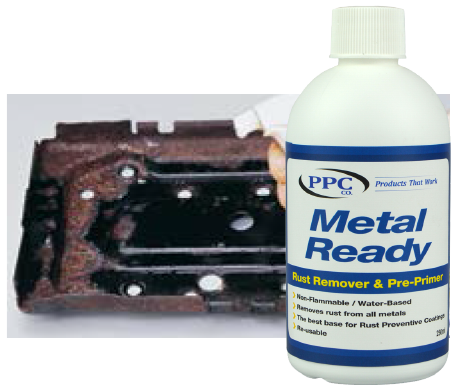 A rust remover/primer, Metal Ready neutralises rust and etches metal for better adhesion. It coats the metal surface with zinc phosphate to encourage deep bonding of Bill Hirsch Miracle Paint to the base metal and rust. Rinse off with water. Before painting ensure the surface is bone dry. It looks horrible after this step but that's good. Coat with Bill Hirsch Miracle Paint (we used Bill Hirsch Miracle Paint silver for the photograph) by painting the rusty or corroded metal with Bill Hirsch Miracle Paint. RIGHT ONTO THE RUST! 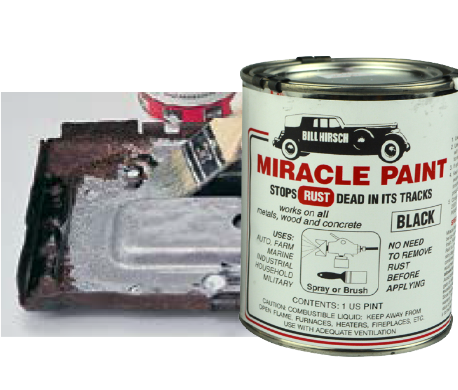 Bill Hirsch Miracle Paint bonds to the rusty metal and forms an unbelievably tough, almost ceramic-like finish that will not crack, chip or peel and stops rust permanently! This stage is not necessary if the parts are not exposed to UV light. (ie. chassis, under vehicles etc.) 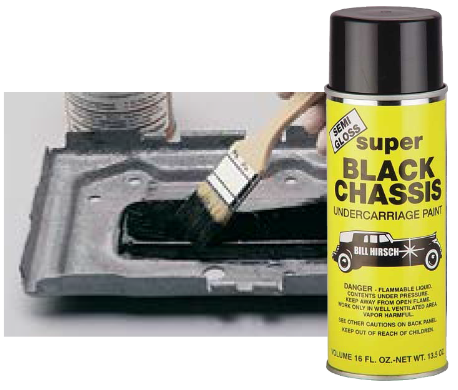 Now it's topcoat option time, we have choices: Bill Hirsch Semi-Gloss Super Black Chassis Undercarriage Paint for certain finish, or topcoat with other paints. Some applications may need an Etch Primer or Acid 8 for proper adhesion. "it's similar in some ways to POR-15 but I found it's a better product, it has better adhesion"
AFTER: Now you have a permanently repaired battery tray, that will not rust again, even if you have an old leaky battery! 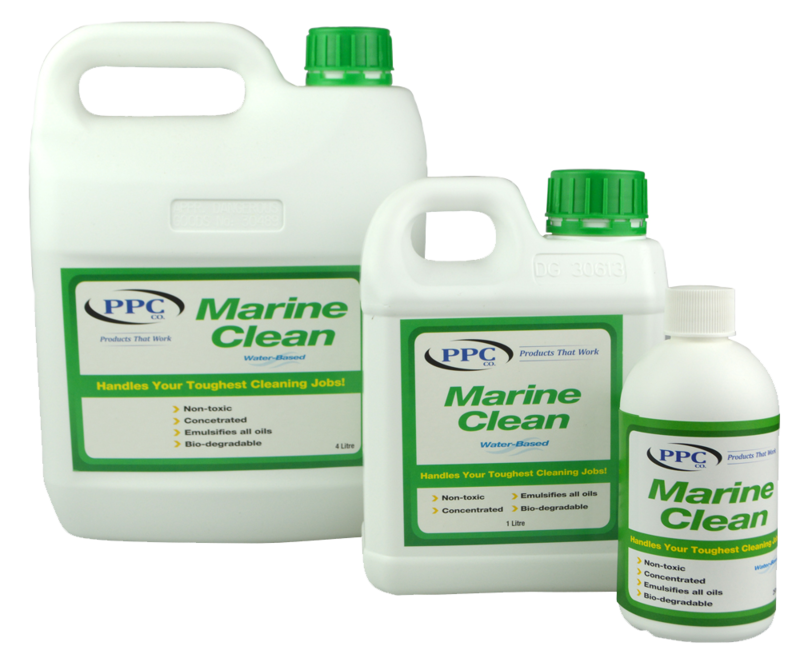 Marine Clean cleans and degreases in one application without leaving residues, noxious fumes or flammable solvent. It makes petroleum-based cleaners almost obsolete because Marine Clean can be diluted 3,4,5, and even 10 times it's volume while remaining more potent than other cleaners. Marine Clean removes grease, oil, mildew, algae, musty odours, soap films and wax. Use it also to clean canvas, vinyl, nylon, holding tanks, grease traps, auto parts and more. 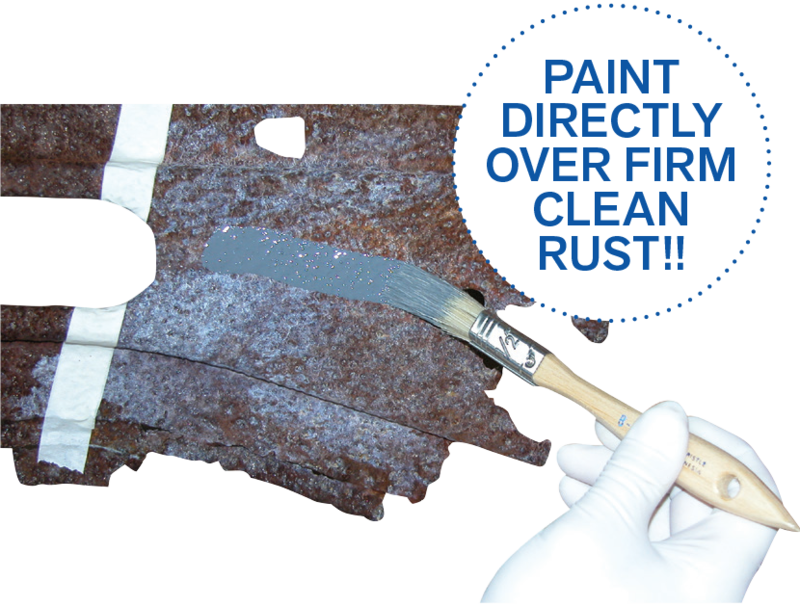 Before applying ANY rust preventative paint or coating, you MUST remove all oily film or residue. Even if you're sure your work is clean hit it with Marine Clean to be certain of good adhesion. This is water based, don’t use solvent based cleaners. 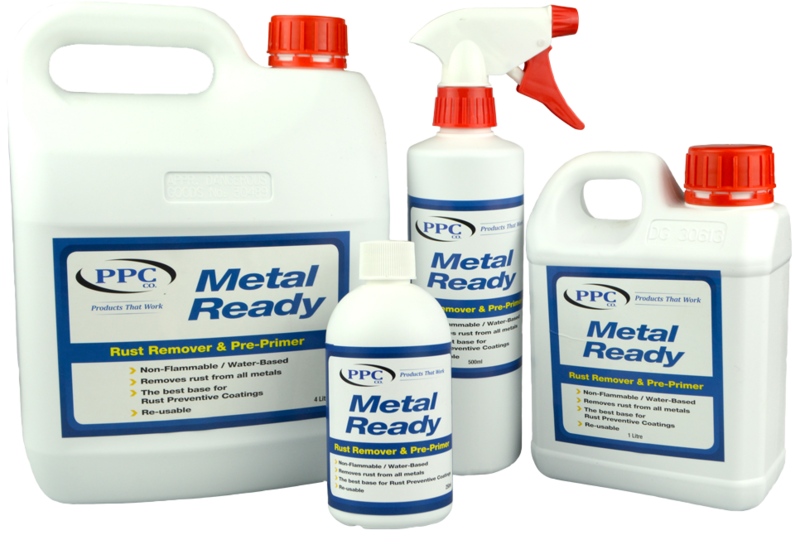 Metal Ready provides the best adhesion on any surface, including aluminium and shiny polished metal surfaces. After thoroughly degreasing your work piece with Marine Clean. Apply Metal Ready, this one step process both neutralises any rust and gently etches any clean bare metal, creating an ideal anchor pattern for coatings such as Bill Hirsch Miracle Paint, whilst simultaneously leaving a zinc phosphate coating to promote chemical bonding of the paint to the steel. The applications are endless. If a surface needs protection, or restoration, odds are that Bill Hirsch Miracle Paint will do the job - and keep on doing it. Bill Hirsch Miracle Paint is so tough you can hit it with a hammer and do no damage. Yet it also has incredible flexibility and can withstand much twisting and bending without cracking. It can be used on all auto work from chassis, front ends, rear ends, axles, floor pans, fuel tanks, engines, battery boxes (acid does not affect Bill Hirsch Miracle Paint nor does brake fluid), to all external work. Even prime your vehicle's exterior. Boat owners use it in a thousand ways. Below decks for engines, engine mounts, bilges, hull maintenance, sealing tanks. Topside maintenance including decks, handrails, metal fittings, chain lockers, hulls - steel, aluminium, wood and fibreglass. 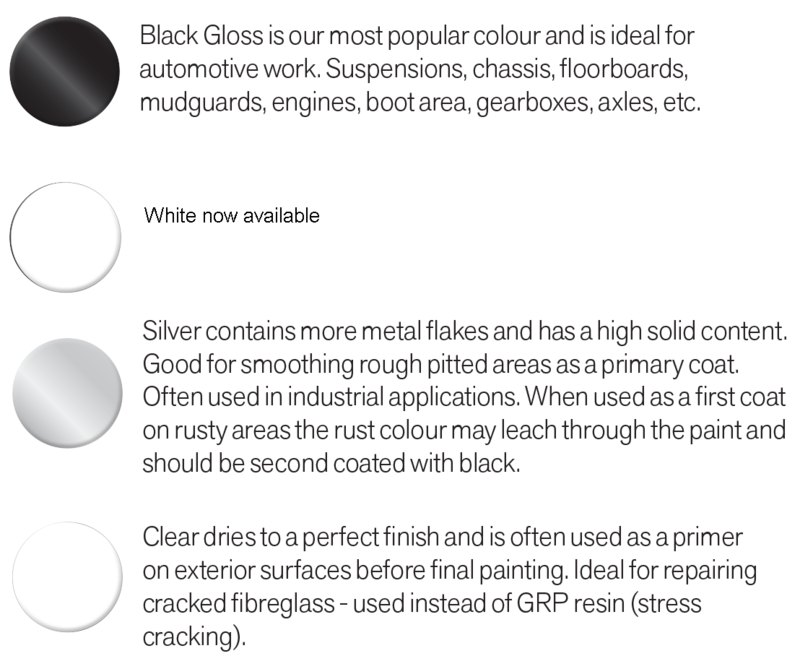 And the Bill Hirsch Miracle Paint range can be used as a complete primer system for steel and aluminium boats. The list is endless. If rust, salt or chemical corrosion are problems then Bill Hirsch is the correct product to use - far better than anything else on the market. Chemical plants, sewage works, indoor pools, to name a few.